The incident garnered national attention in contemporary news outlets, including a three-page spread in Life magazine. [Scroll down to page 26.] Several images captured the unfolding events and the aftermath, including a triumphant Simeon Oxendine wrapped in the captured KKK banner. Oxendine was a prominent Lumbee community leader and a World War II veteran who flew more than 30 bombing missions. Thank You for preserving this piece of history and for the the brave men of the Lumbee Tribe who stood their ground and stamped out the KKK rally at the Battle of Maxton Field. Please honor their memory. I also pray Americans will continue to say "no" to hateful groups like the KKK and others who claim "white" supremacy. In Lord Jesus Name, amen. 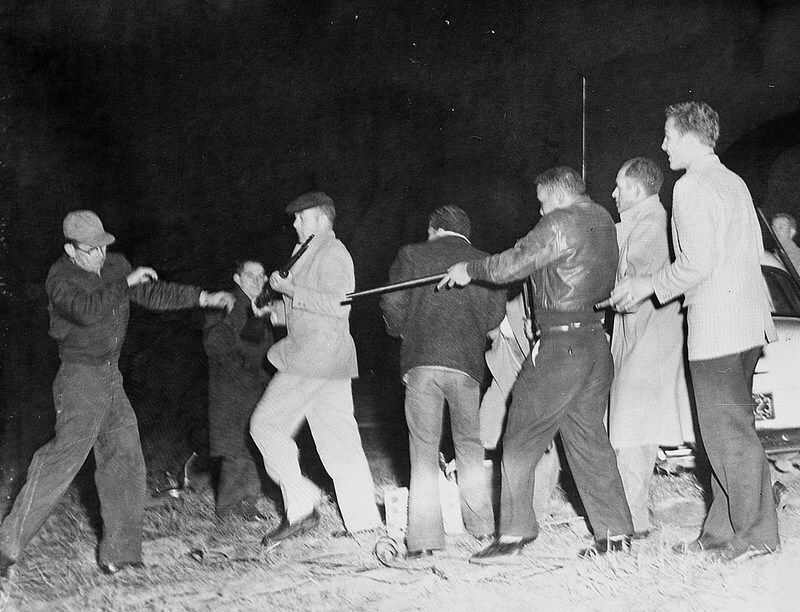 Nicholas Graham, "January 1958: The Lumbees face the Klan." This Month in North Carolina History, January 2005. Provided by UNC Libraries / North Carolina Collection. The Battle of Hayes Pond was an armed confrontation between the Knights of the Ku Klux Klan and the Lumbee Indians at a Klan rally near Maxton, North Carolina, on the night of January 18, 1958. Grand Dragon James W. "Catfish" Cole was the organizer of the Klan rally. Sanford Locklear, Simeon Oxendine and Neill Lowery were leaders of the Lumbee who attacked the Klansmen and successfully disrupted the rally. Like snow on a sunny day. With buckshot in his pants. During the 1950s, the Croatan Indians (as they were then called) made nationwide news when they came into conflict with the Knights of the Ku Klux Klan, a white supremacist organization headed by Klan Grand Dragon James W. "Catfish" Cole. Cole began a campaign of harassment against the Lumbee, claiming they were "mongrels and half-breeds" whose "race mixing" threatened to upset the established order of segregated Jim Crow South. After giving a series of speeches denouncing the "loose morals" of Lumbee women, Cole burned a cross in the front yard of a Lumbee woman in St. Pauls, North Carolina, as a "warning" against "race mixing". Emboldened, Cole called for a Klan rally on January 18, 1958, near the town of Maxton. The Lumbee, led by recent veterans of the Second World War, decided to disrupt the rally. The "Battle of Hayes Pond", also known as "the Klan Rout", made national news. Cole had predicted more than 5,000 Klansmen would show up for the rally, but fewer than 100 and possibly as few as three dozen attended. Approximately 500 Lumbee, armed with guns and sticks, gathered in a nearby swamp, and when they realized they possessed an overwhelming numerical advantage, attacked the Klansmen. The Lumbee encircled the Klansmen, opening fire and wounding four Klansmen in the first volley, none seriously. The remaining Klansmen panicked and fled. Cole was found in the swamps, arrested and tried for inciting a riot. The Lumbee celebrated the victory by burning Klan regalia and dancing around the open flames. The Battle of Hayes Pond, which marked the end of Klan activity in Robeson County, is celebrated as a Lumbee holiday.